So I decided to post these pictures. They have been languishing in the depths of my cellphone, disconsolately waiting for me to a) get a microSD card and b) actually bother to use it. 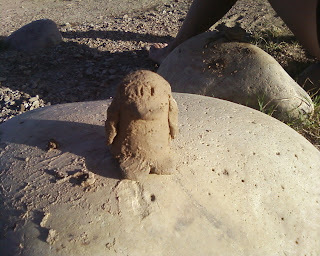 This is a penguin I made from clay found in Jordanelle reservoir. I think it actually turned out pretty good, and I wanted to take it home and fire it, but I didn't think that Cara would really let me get away with taking mud in her car. 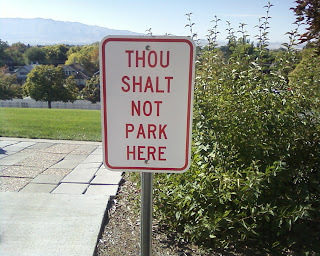 The people at the Logan temple definitely have a sense of humor. Commutative diagrams ftw. 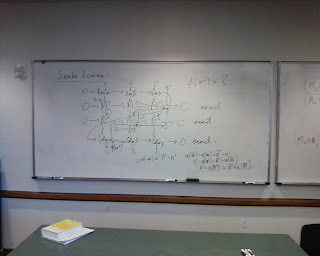 This is more or less the proof of the snake lemma, as drawn by Prof. Roberts. 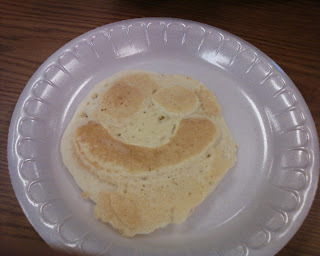 Joe Brinton made me a smiley pancake. It was as delicious as it was friendly. In unrelated news, microSD cards are really, really small. Does it feel like it was ever warm enough to be at the lake? I would not have let you bring the mud home in my car, but I do like pancakes. Fun pictures. Ahhh good memories of the weird mud!